Bogdan Sylvestrovich Lepky (November 4, 1872, village Kryvenke, now Chortkiv district, Ternopil region – July 21, 1941, Krakow, Poland) – Ukrainian writer. Bogdan was born in a village priest’s family (his father was also a writer). He studied in Berezhany (now Ternopil region) in elementary school (1878 – 1883) and gymnasium (1883 – 1891). From 1891 to 1892 he studied at the University of Vienna, from 1892 – at the University of Lviv, graduating in 1895. In 1895 – 1899 he taught humanities at the Berezhany gymnasium, in 1899 – 1915 and 1925 – 1939 – Ukrainian literature at Krakow University. From 1932 he was an ordinary professor of this university. B. Lepky turned to the literary creativity while studying in a gymnasium. During his life he published 14 poetic collections (1901-1930) and 12 collections of short stories (1897-1926). 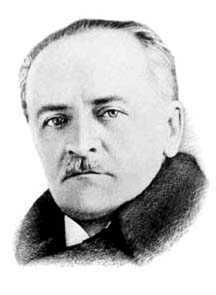 Later in 1927 – 1941 he wrote and published a number of stories and novels on historical themes, among which – his greatest work: the novel "Mazepa" in 5 volumes (1926 – 1929). Bogdan Lepky wrote many works in literary criticism, fruitfully worked as a publisher of Ukrainian fiction and a translator of works of Ukrainian writers in the Polish language. The works of B. Lepky, published in his life, were distributed exclusively in Galicia and in a free world. Neither in the Russian Empire nor in the Soviet Union they have ever been published. After the "liberation" of Western Ukraine by the Soviets (1939), his works were seized and mostly destroyed even there. In independent Ukraine, there is still no systematic reprint of the rich creative heritage of Bogdan Lepky. Full acquaintance with his creativity is the case of the future.